May 4th, 2013 | Moving Tips, News and Events, Wheaton World Wide Moving. This might seem like a simplistic tip, but it’s one that can really help out. During the moving process there are going to be lots of forms that are signed, stray papers, receipts, paint swatches, wallpaper clippings, directions, maps….. I think you get the hint. There are going to be a lot of random items, and you’re going to need somewhere to organize all of them. Hence, the notebook. 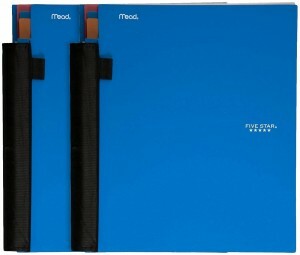 We suggest the Mead Five Start Advance 5 Subject Notebook, but if it has big pages, pouches and folders, it will work. Do you have a picture of your moving notebook? To see all of Wheaton’s National Move Month Tips, click here.